Website for the Los Angeles based satellite of Fortune 500 company Xinhua Finance Media. 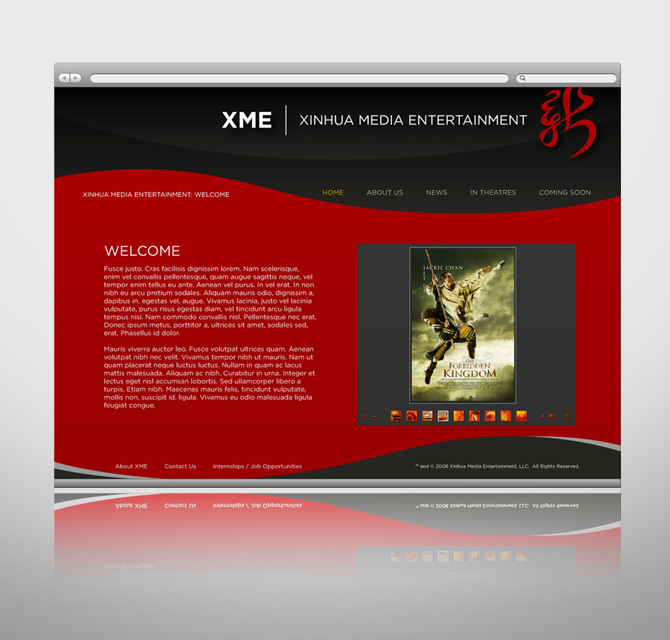 The production company is unique in its ability to connect the Chinese and Hollywood film communities, and wanted a bold website with an aesthetic that reflected its dual heritage. In addition to a flash-based slideshow component to effortlessly show off posters and trailers for their latest films, it was important to Xinhua’s Media Entertainment team to be able to update all elements of the site in house. To accomplish this task, the site was fitted with a custom back-end content management system based on the WordPress engine and in house instruction sessions were led by Ogmog to bring all staff up to speed on the intuitive updating system.